today I am posting ( a bit late) my DT card for the current challenge running over at the Craftymessers Challenge Blog for the next fortnight. My card is a standard 5x5 basecard in white with a smaller square of lilac card matted to the front. 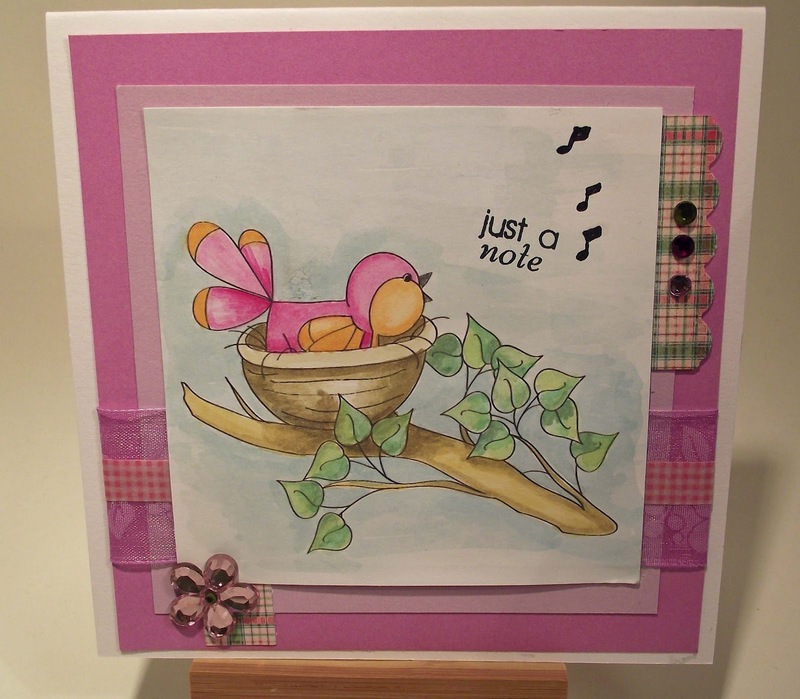 I coloured my image with watercolours and adhered the finished image to a square of pink card that had been decorated with some lilac organza ribbon and pink check Washi Tape. Some Pink and Green gems and a Pink flower were added as embellishments and some green and pink check backing-paper was added for contrast. The senitment was stamped in Stäz-On black ink and I hand drew the 'notes' with a fine black marker. Thanks for stopping by to read my blog. I appreciate your time and comments. 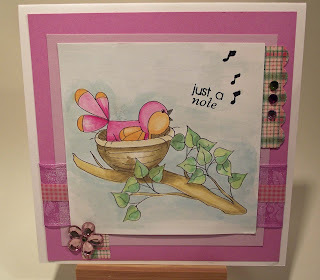 Don't forget to check in with the Craftymessers Challenge Blog see the DTs fab work with these great images. All cardstock, backing-paper and ribbons from stash. Sentiment - Just a Note- from Stamps of Life. Love this and how you have worked with the image.